Never let your pristine kicks touch the filthy ground with these thick-soled shoe-sandals. They strap onto another pair of shoes, in this case a pair of military-style, high-top sneakers. Both pairs are the latest offerings of Chinese fashion brand Sankuanz who unveiled the bulky combo on the runway at Paris Men's Fashion Week in late January. [Sankuanz] sent male models down the runway wearing high top sneakers — that never actually touched the runway. 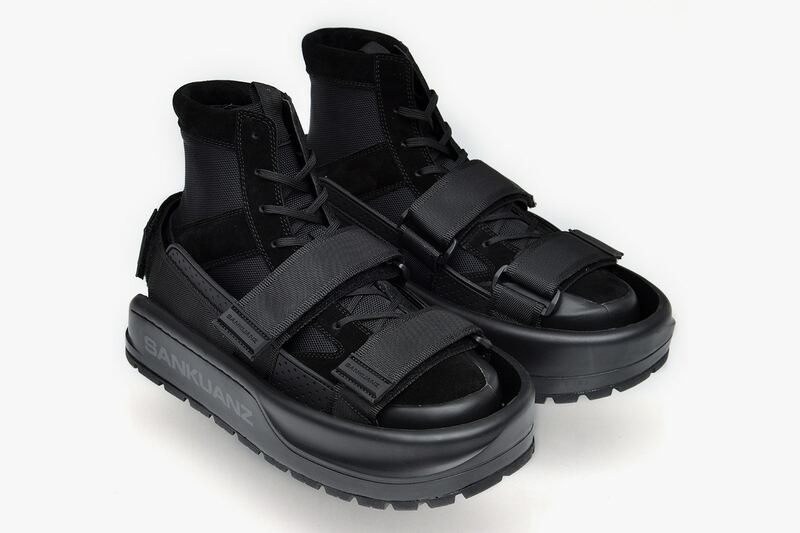 "They're transformable sneakers that have an outer layer of protective sandal that you can enter Velcro into and you can strap them on or off," is how Sankuanz publicist Courtney Wittich describes the concept. But ultimately, they look like big-cushioned, rubber and plastic orthopedic Birkenstocks — with Velcro straps — and you strap them on top of your existing shoes. "You can walk totally normal in them and it gives you an extra layer of protection and then also height," Wittich says. Either way, the shoe-sandals will be available in August for $355 and I don't think the sneakers are included in that price.